Choosing a web hosting provider can be a bit overwhelming primarily because different people have different needs, and you will be lucky to find a hosting provider that offers everything at a top notch level. There is no such thing as a perfect web hosting service, however JustHost comes rather close. We have placed JustHost in one of our top position rankings due to its superior reliability while not having to sacrifice on the affordability aspect. In fact, while JustHost has an attractive monthly introductory rate, the hardly spoken about renewal rates are one of the best in the web hosting industry. 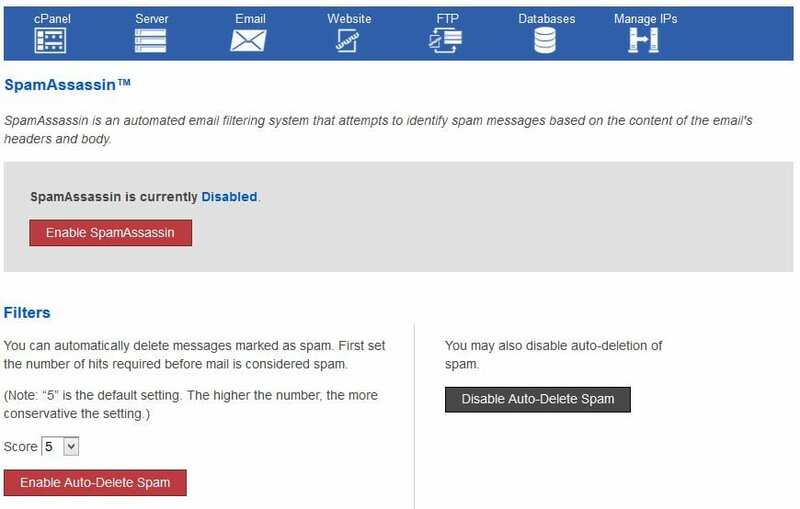 Furthermore, JustHost provides all of the robust features webmasters have come to expect while using the ever friendly and navigable cPanel control panel. That said, it is quite interesting that JustHost mainly targets individual webmasters as their primary customer base. JustHost proves to be an incredible service for all types of users and while they do offer VPS or dedicated hosting upgrades (at incredible pricing no less), it is not something they actively promote. JustHost also includes free advanced security for your site such as ‘Spam Assassin Protection.’ They will also submit your site to the various search engines and give you $200 of free advertising credits to help increase your website’s exposure. Since many of JustHost’s customers are individual webmasters, and most likely beginners, they receive an above average amount of support inquiries. JustHost employs over 500 people, many of whom are solely designated for the customer service department. However, that does not slow them down. They have an outstanding reputation for their super-efficient response times and a particularly knowledgeable staff team. 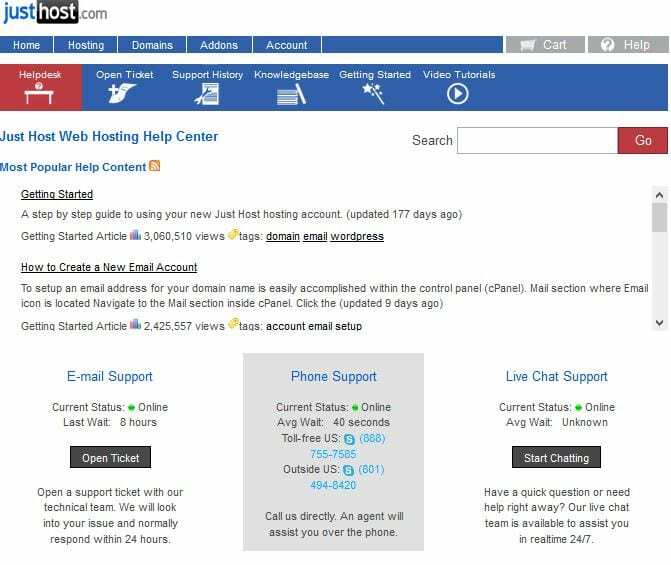 Just like other name brand web hosting companies, JustHost offers live chat, phone and email support. Our live chat wait time was 4 minutes. The email support is also very impressive since they have a “no ticket left behind” policy. You can look through your support and e-mail history to see prior response times – a true testament to their gold standard. On the actual support page, the average wait times are publicly displayed for each support channel (live chat, phone or e-mail). Additionally, JustHost provides their customers with a user forum, FAQs, a knowledgebase and video tutorials that deliver step by step instructions on several web hosting and site building processes. Lastly, JustHost stands by their service by offering an anytime money back guarantee. You can cancel your service for whatever reason and you will receive a refund on the unused time. Overall, we have found JustHost to be a leader in customer service. JustHost uses the comprehensive and user-friendly cPanel control panel, which has the hosting features nicely incorporated into it. Like BlueHost though, JustHost engineers took the cPanel and customized it so advanced webmasters would enjoy the experience as well. Also like BlueHost, JustHost uses the Mojo Marketplace which has over 100 open source applications, plug-ins and themes – all one click installations making for a seamless integration experience. The beauty of JustHost is that there is no prior technical understanding required. Everything takes some amount of time to learn, however JustHost really streamlines everything to the point where an amateur can fully understand and navigate the control panel within just a few short minutes. JustHost preaches “simplicity” and “integration” as two of their top 10 reasons on why you should choose JustHost, and we feel this to be an accurate portrayal of their service. Perhaps JustHost really over simplifies the website building process. So if you are a beginner, JustHost is really a great choice for you. The drag and drop website builder is a great tool. JustHost also offers a few dozen templates and up to 1,000 on an upgraded account. By using the free script library called SimpleScripts, CMS installations for WordPress, Joomla and Drupal are also one click installation processes (just as the Mojo Marketplace is). However, we are happy to note that more professional and tech savvy individuals will also enjoy the JustHost website building experience. As mentioned perviously, you can add cron jobs (and java script). You can also customize your 404 error pages. You can essentially play around with, customize and manage your site as much as you would like, and JustHost makes that easy with the File Manager in your cPanel control panel. Moroever, adding a shopping cart to an e-commerce site was also a surprisingly pleasurable experience. We could not find JustHost’s 99.9% guarantee so we decided to live chat them again (this time the response time was even better – 2 minutes). Support rep David T. answered our inquiry. He said, “Our record uptime is 99.9%. Our average downtime can be up to 45 minutes of monthly server maintenance. You can always check your server’s status by logging into your cPanel and scrolling down to the “Advanced” section and clicking on the “Server Status” icon. We also send out email notifications to you letting you know when we plan on doing maintenance to the server your account is on. However, we don’t have a guarantee listed.” Judging by our personal experience and literally hundreds of other customer reviews, JustHost has the best reliability record of any web hosting service. JustHost ‘wows’ in many of the major categories people look at when choosing a web hosting provider. This is especially true in regard to their reliability and customer support. Yes, JustHost largely markets themselves to the individual user however their VPS and dedicated hosting plans are probably one of the best kept secrets of the hosting industry. They offer both standard and advanced features, and have custom tailored their control panel to be more user friendly. Users all across the spectrum would be happy with JustHost.